NEW YORK, New York, May 22, 2014 (ENS) – Predicting a “near-normal or below-normal” Atlantic hurricane season this year, national weather officials today emphasized that “it only takes one” hurricane to carve a path of destruction across a wide area. The 2014 Atlantic hurricane season outlook issued today by NOAA’s Climate Prediction Center calls for a 50 percent chance of a below-normal season, a 40 percent chance of a near-normal season, and only a 10 percent chance of an above-normal season. Hurricane Danielle photographed by an Expedition 24 crew member on the International Space Station, Aug. 27, 2010. For the six-month hurricane season, which begins June 1, NOAA predicts a 70 percent likelihood of eight to 13 named storms with winds of 39 miles per hour or higher. Of these, three to six could become hurricanes with winds of 74 mph or higher. 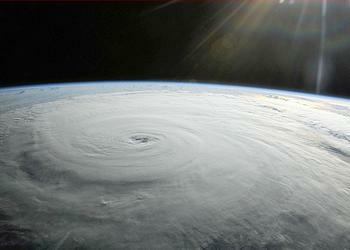 One or two could blow up into major hurricanes ranked in categories 3, 4 or 5 with winds of 111 mph or higher. These predictions are near or below the seasonal averages of 12 named storms, six hurricanes and three major hurricanes, based on the average from 1981 to 2010. This year’s outlook is shaped by the development of an El Niño warming trend expected this summer in the Eastern Tropical Pacific Ocean. Gerry Bell, PhD, lead seasonal hurricane forecaster with NOAA’s Climate Prediction Center, explained, “Atmospheric and oceanic conditions across the tropical Pacific are already taking on some El Niño characteristics. Also, we are currently seeing strong trade winds and wind shear over the tropical Atlantic, and NOAA’s climate models predict these conditions will persist, in part because of El Niño. El Niño causes stronger wind shear, which reduces the number and intensity of tropical storms and hurricanes. El Niño can also strengthen the trade winds and increase the atmospheric stability across the tropical Atlantic, making it more difficult for cloud systems coming off of Africa to intensify into tropical storms. “The expectation of near-average Atlantic Ocean temperatures this season, rather than the above-average temperatures seen since 1995, also suggests fewer Atlantic hurricanes,” said Bell. NOAA is rolling out new tools at the National Hurricane Center this year. An experimental mapping tool will be used to show communities their storm surge flood threat. 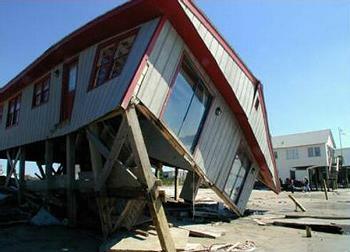 Storm surge is an abnormal rise of water generated by a storm, over and above the predicted tides. This rise in water level can cause extreme flooding in coastal areas particularly when storm surge coincides with normal high tide, resulting in storm tides reaching up to 20 feet. The new storm surge maps will be issued for coastal areas along the entire Atlantic and Gulf of Mexico coastlines. They will appear when a hurricane or tropical storm watch is first issued, or 48 hours before the anticipated onset of tropical storm force winds. The map will show land areas where storm surge could occur and how high above ground the water could reach in those areas. The map will be updated every six hours during the storm event. “And even though we expect El Niño to suppress the number of storms this season, it’s important to remember it takes only one land-falling storm to cause a disaster,” she said. “Hurricane Sandy reminded us that loss of life and property in tropical storms comes about through storm surge,” said Sullivan, also speaking from the New York City Emergency Operations Center. New York suffered great damage during Sandy, a gigantic hurricane which struck during the last week in October 2012, claiming 285 lives in the along the Atlantic coast and the Caribbean and causing over $68 billion worth of damage. 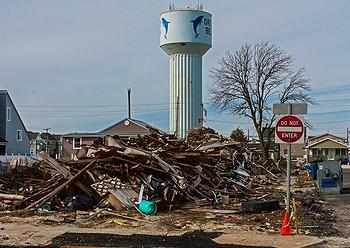 “This hazard to our coastlines will worsen in the decades ahead,” warned Sullivan. Joseph Bruno, commissioner of the NYC Office of Emergency Management today unveiled a new system to help New Yorkers prepare for severe storms. The Know your Zone awareness campaign divides New York into six evacuation zones. New Yorkers can call 311 to find out what zone they are in, they can have a zone guide sent to them or use the map provided by the guides we prepared and distributed. The Office of Emergency Management will hold hundreds of community events in 13 languages this season to help New York residents be prepared for storms. Being prepared means having resources to survive – food, water, shelter for 72 hours. It means knowing to go and what to take such as important documents and medicine. “You need to know when your zone evacuates. If you go before your zone, you create a traffic jam and no one can evacuate,” Nimmich warned. 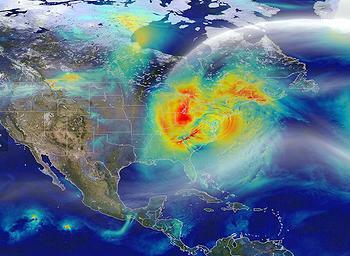 By 2015, new computer models working with better information from hurricane hunter planes and satellites will be able to predict storm surges even before they form, a services that will help citizens of the United States and Caribbean countries, said Louis Uccellini, PhD, director of NOAA’s National Weather Service. “We’ve been working since Sandy to accelerate improvements in our entire [computer] model suite,” said Uccellini. For greater accuracy, the resolution of the forecast model has been doubled to 13 kilometers, he said. Climate change is a factor in this year’s hurricane outlook, but it is not the dominant factor, said Bell. “The outlook this year reflects competing climate factors,” he told reporters. Since 1995, we have been in a “multi-decadal cycle,” a high time for hurricanes that favors more activity. Within that cycle, this year El Niño is expected to suppress Atlantic hurricane activity, producing near normal sea surface temperatures rather than the above normal temperatures of the past several years. El Niños occur every three to five years, the last one was in 2009-2010. These warm conditions in the equatorial Pacific are part of a cycle that includes the cooling La Nina trend. “The primary mechanism is the multi-decadal cycle rather than greenhouse global warming,” said Bell.